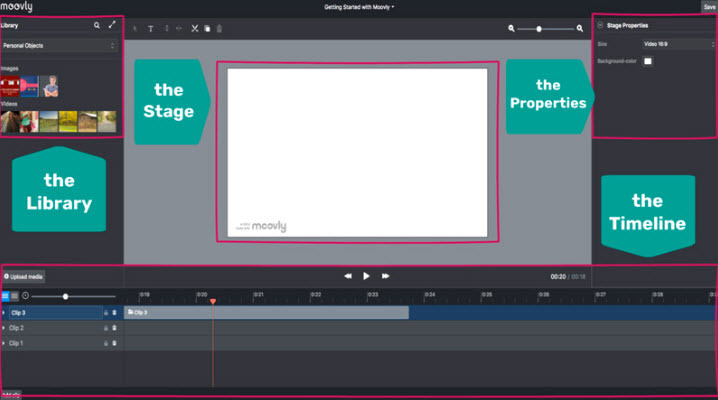 The best editor helps you easily make business animation video with powerful features. Video content is dominating the market with a huge arena to explore. Be it a short clip that explains your company/product or a user guide kind of thing, when you are up for business explainer videos, there is nothing better than illustrative animated videos. These animated videos can be made without much hassle and can bring exceptional results for your business. All that you need to do is, figure out the right tool for business animation and convey your message aptly to the audience, and then rest will be history. Here we recommend using FilmoraPro if you want to make animated videos for your business. You can use it to make business animation video by adding keyframes, so the animation will be smooth and natural. You just need to build a white plane to easily start making animation. Besides, color correction and audio mixer will raise up your business video to a new level. Download it to have a try (Free)! This online tool can let you edit, create, and share animated videos for business intuitively. You get more than 80 ready-to-edit video templates for business or build them from scratch to suit your business demands. These templates are completely customizable for your needs and make Wideo a much liked tool. You can build amazing animated videos effortlessly. You just spend 5 minutes to pick the template and customize by drag and drop, and you are sorted to create a professional looking animated business. Either download as a MP4 or share on social media sites like Facebook and YouTube, Wideo does it all. Being in your budget and still creating fabulous videos which are intuitive and simple for your business is possible with Moovly. Using this tool you can create animated video, banners, Ads, Whiteboard animation, YouTube intro, and engaging explainer video. You don’t need to install it, as it can directly be done on your desktop. You need not more than 15 minutes to do a video. More than 600000 free samples, videos, animations and sounds are readily available and you are allowed to use your own media too. PowToon can create engaging explainer animated videos for business, which can captivate the audience. Be it marketing, HR, IT, report making or training your videos always standout. These videos are useful for creating personal videos to surprise your loved ones, make attention grabbing learning material, and captivating office presentations. 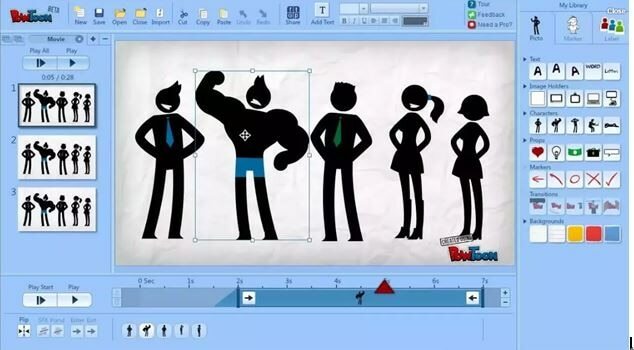 Anyday a PowToon weighs over video as it can engage, explain and market your idea in the work place. With inbuilt drag and drop template a high quality PowToon is just made within 20 minutes. With a growing community of fellow designers, you can easily get help for a new video from them. They have a simple and stress free process to create an animation. They arrange a call for you to get a creative brief and start the process. Be it script, voiceover, design, or animation, they can integrate it better. This open source video animator has is free to use and has 3D creation suite. 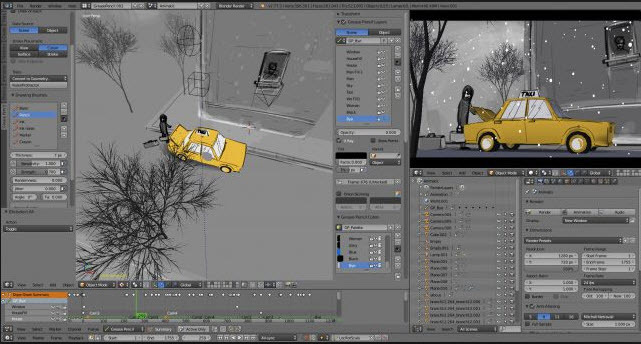 Rigging, modeling, animation, rendering, simulation, motion tracking and compositing, game creation, as well as video editing is possible with Blender. You can get attractive ultra-realistic rendering with cycle render engine from Blender. This is a public project by numbers of scientists, VFX experts, artists animators and the likes. The high end modeling tools help in sculpting, modeling, and UV features are remarkable. 3D painting using textured brushes and masking allows crisper out comes. Creating vector business animations and publish them instantly is made easy. These animations include – apps, web, and games to name a few. You can reach the target audience through mobile, desktop, and TV. With animation and illustration tools creating web-based interactive content is easy now, be it game environments, player sprites, or interfaces your games and Ads will stand out. You can export the animations to multiple platforms like WebGL, HTML5 Canvas, Flash/Adobe AIR and the likes. Create interactive web banners and lively expressive characters using tilt and pressure sensitive brushes. Your business explainer videos can be flawlessly designed with interactive 3D animation package like Muvizu. You can drag and drop the customizable animated characters with sets and use the automatic lip-synching feature for a great video. Worldwide it’s a great tool for demonstrators to use as a lesson building element that reaches students with the right message. With their easy commercial terms, you can earn money from your animations without any hassle. Engaging content that can reach the audience quickly with super-fast controls. Revered as the easiest 2D animation program it allows animators to create compelling business animations. You can add life to logos, images, and props using the elastic motion effects as well as the inbuilt templates. 2D talking characters are built using bone ridge editors, facial puppet, motion libraries for web, videos, apps, games, and presentations. It comes with a preview camera for reviewing scenes and live camera for using key frames to animate the position of the camera. A rich environment to edit animation, actors, special effects and scenes. You can navigate scenes using perspective mode in order to experience the movements of the camera in realistic 3D feel. Animated videos for business is a great medium for brand development as they wonderfully collaborate color schemes, logos, brand images with the right kind of audio visuals for creating a complete packaged deal. These animated audio visuals make your branding more appealing by creating recurrent themes, which keeps the background or foundation intact, while the characters in the clip move. Animation also helps you to develop more sophisticated creatives and brand icons that can strengthen your marketing pitch. It doesn’t matter whether you are a seasoned player in online marketing or an amateur, the right animated video can speak volumes to promote your business. With animated videos you save plenty of money and time that gets wasted with traditionally shot videos. The surging costs to track a location, hire a crew, pay the artists, pay for top-notch equipment, arrange the set, etc. can make a hole in your pocket. But, business animation can drastically reverse the expenses by creating a beautiful amalgamation of voiceover, visual, and audio content to deliver a beautiful story. The right animation artist and the correct tool can help you woo your audience like never before. If you don’t like something in an animated video, then only that part is chopped and edited to add something more substantial. A video content is always appealing to the audience, as apart from plain text it is loaded with interesting audio visuals. Human brain being thirsty for knowledge through sight and experience is keen to consume more of audio visual things. This in turn helps you create better engagement with your target group. Animated videos being a popular medium of imparting knowledge and message, deliver a clear and crisp message in a short span of tome and encourage audio visual learning. Apart from using the above mentioned tools for creating business explainer videos, you could use Wondershare FilmoraPro and edit your video while rendering powerful effects. We are sure that with this tool, there is no room for being disappointed. It can seamlessly create the most engaging videos with the least professional video editing.